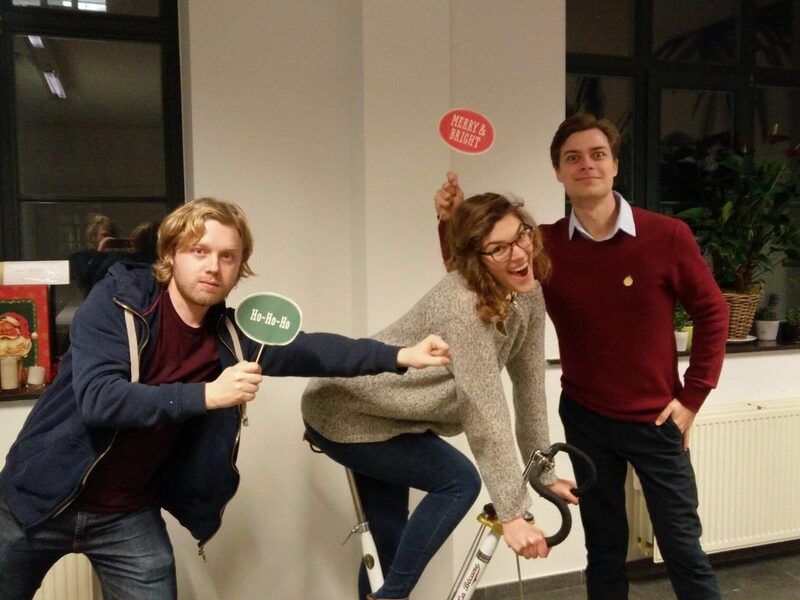 A bunch of smaller improvements while preparing the second part of de Quizfabriek quiz season. Nothing too exciting, but improving the player experience step by step. “Activity rounds” can now have attachments that are triggered by the quizmaster. This way you can show an image, video or audio fragment while doing a daredevil-duel. This is also the only attachment type that can be manually repeated (for now). By loading optimized attachment previews the pageload for quizzes with huge amounts of attachments should be smoother now. We’re experimenting with a new monetization strategy by showing ads for non-paying users. 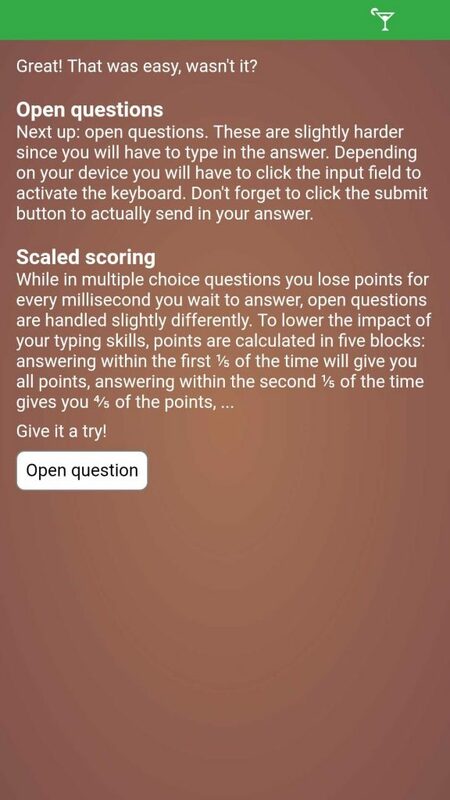 In “Live” quizzes, players can now play a tutorial while waiting for the game to start. The four most important question types are explained and players can get some hands on experience, whilest also filling in a small questionaire about how they’ve learned about your quiz. Player position calculation is finally fixed, so players won’t share the same spot when they have the same score now. 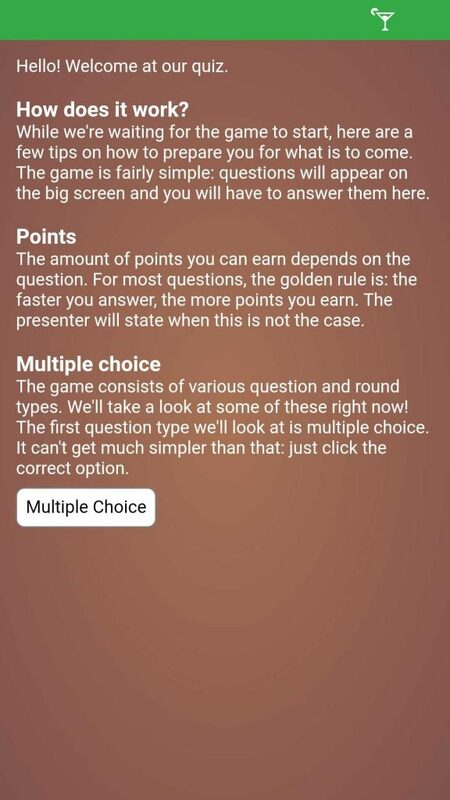 In “Presentation” quiz types players can now refresh their page without losing their points; this is also the case for people playing the regular party game mode. “Activity round” intro’s are slightly more entertaining by not showing the selected players straight away. “Image map” questions are now automatically rotated to fit the largest area on the players screen. We’ve also created a mod that allows players to order drinks straight from the remote view. Contact us in case you’d like to use this feature. We’ve been working on a bunch of new features and improvement to start you of with a quiztastic 2019. 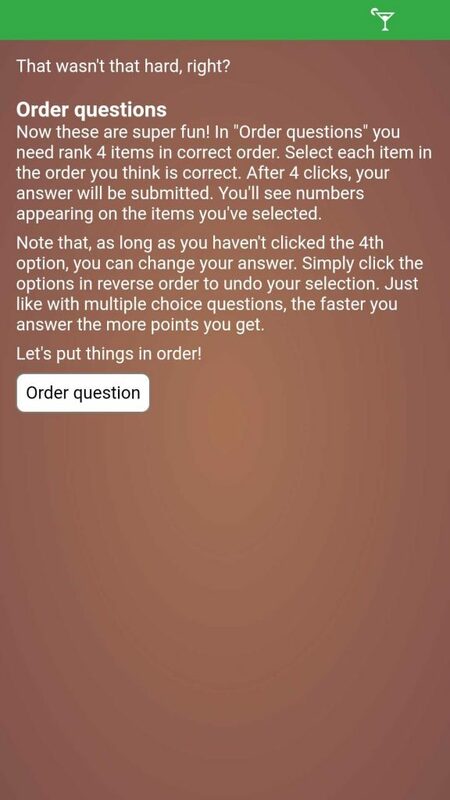 “Traditional” quiz round allows players to change their answer until the last question of the round. “Image map” questions asks players to select a position on an image displayed on the player device. Round attachments are displayed before or after the start of a round. We’re also working on the user interface for presenter and jury and we have added a fullscreen button on the player devices (android only for now, iOS devices should follow soon). We’ll try to keep everyone a bit more in the loop on what changes to expect in the future! A very happy new year to you! May 2016 be the year in which your dreams come true and your games get played a lot! 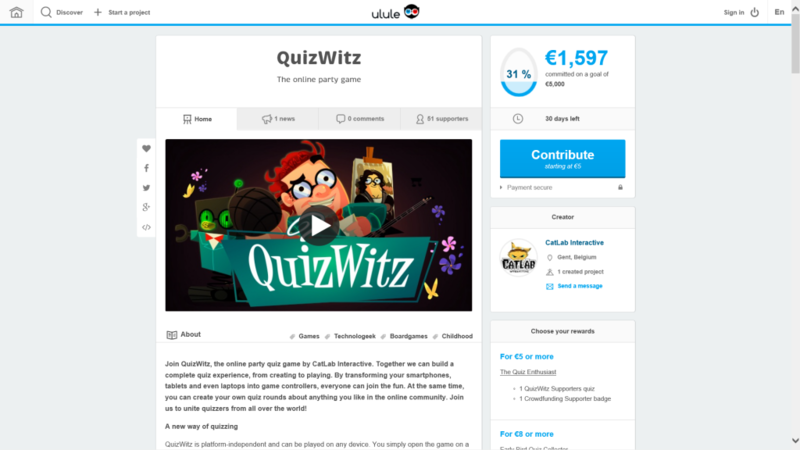 It’s time for the third post in our series about our crowdfunding campaign! As we’ve mentioned before, crowdfunding requires a lot of time and effort. It’s really something you can only go into with a lot of preparation. Among that preparation is knowing the basics, defining your story, target goal and rewards, and last but not least, a communications plan. We’ll have a look at the theory and how we went about everything, so grab your notebook or a cup of tea and read along. Remember the canvas we shared with you at the beginning of this series? It helps you to define your campaign in detail. The communications can be split up into distinct steps as well, and that’s where the Campaign plan canvas comes into play. It was created by Douw & Koren, a crowdfunding consultancy agency from the Netherlands. We used it too, although in hindsight, we should’ve planned it out even more! Let’s have a look at the canvas. The campaign can be divided into three stages: before, during and after. The period of the campaign itself can be broken down into three different groups of people you’ll want to engage. The intimi: These are the people you know on a personal level or who are otherwise already invested in your project before the campaign starts. They will help out of sympathy. Your network: This group consists of the people you know, but don’t follow up on you all the time. Think friends on Facebook and in your LinkedIn network. They will back for interesting rewards. The crowd: This is the largest group of people, but the hardest to reach and engage. They will only back your project if it interests them and resonates. This chronological order might seem odd, but if your closest friends and family back the first 20%, you‘ll look a lot more promising to the next visitors and after 50% to the media. Lastly, you should definitely NOT neglect the pre- and post-campaign communications. The “pre” helps you to engage your first ambassadors. You could invite friends and family to brainstorm about your rewards or help you with your video. The latter will require you to stay in touch with your backers, but this will actually keep them invested in your great cause! Compare it to a snowball… If the first tight snow doesn’t stick, the loose one you’ll roll over later won’t either! Social media and blogs can go a long way, but think it through. Make sure you plan the post times of your campaign and measure the value of your messages so your community won’t get bored with you. You can easily come across as pleading when you’re actually trying to build a community. People must feel welcome and be convinced their support will be vital. Don’t turn to social media immediately after launch. If people visit your campaign and there’s nothing there, you might lose interest. When you reach the first 20%, it’s time to get in touch with your network. By the 50% mark, you go and add the media in the mix. More on that in our next topic. In the middle of your campaign, there will probably be a quiet moment. Stay positive and use any opportunity you can to get your message out there. People will still visit your campaign and decide to eventually back you later. Keep them invested with some fun actions and content! Don’t forget your past backers! Those are the people that (hopefully) want to see your project succeed. Don’t be afraid to ask them for a share or a small investment of time in another way. We asked for a share of a pinned Facebook post and nearing the end of our campaign, backers could change their profile picture into our quiz host character Ted. We were a bit late with this, but we had some success in that regard as well. Don’t forget to thank your backers every now and then. They’re your VIP’s. A crowdfunding platform often allows you to publish blog posts on your campaign. Make use of this feature to show people the project is alive and kicking. Let them see their investment is safe in your hands and you’ll work hard to succeed. Ask them for feedback or their ideas when you can. Attention! Do keep an eye on the news value you bring with each message or sub-campaign. 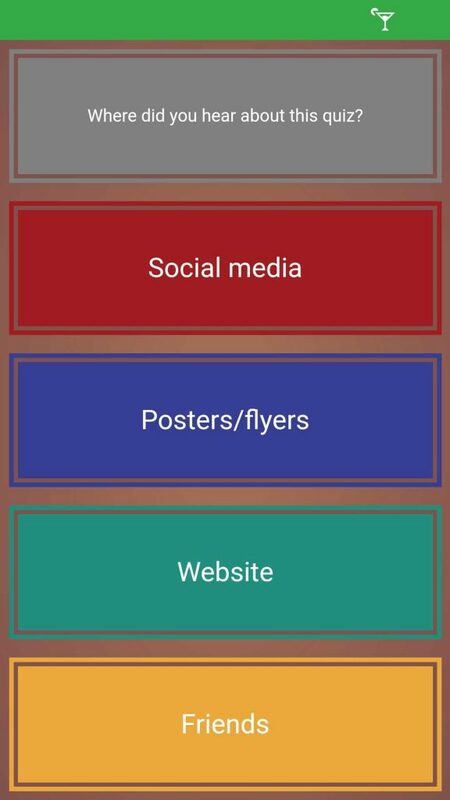 Press relations can help you to reach a larger amount of people, identified in the canvas as the crowd. Press releases are hard work and require some time if you decide to write them yourself. You could hire a professional but those people will cost you! We decided to write them ourselves, as we had the possibility to spread them thanks to the press list of the Flemish Games Association (FLEGA). Being a member of a supporting organization in your country or region helps a lot! Add to that the fact that the city we’re located in publishes its own press list was a great help as well! 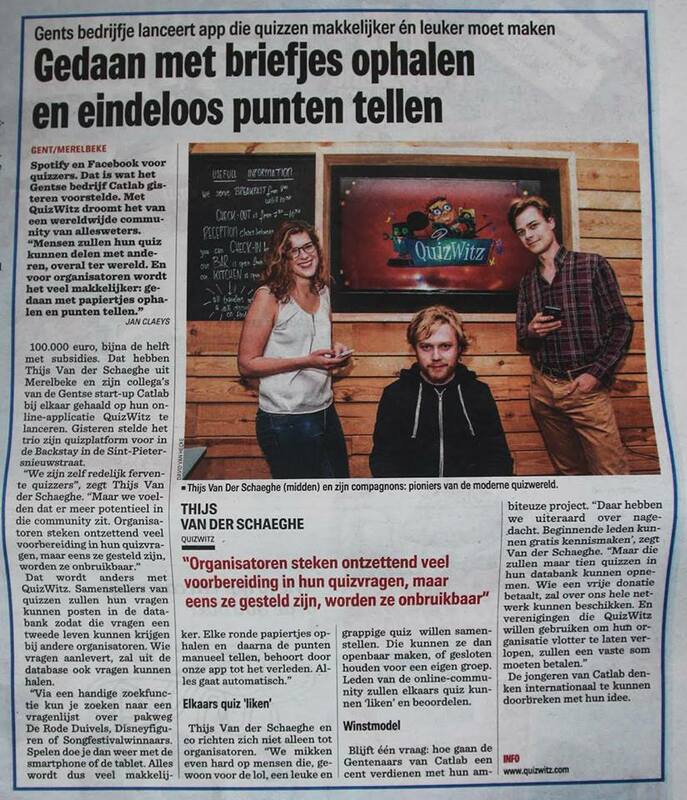 Thank you Ghent, we were in the newspaper! When you write a press release, always keep an eye on the added value covering your story might bring for the news outlet you’re contacting. Take your time to decide which message you want them to cover as well. If you don’t know what to say, then no editor will. They can’t look inside your mind after all. Reach out to the press on a personal level if you want to increase your chances. Writing a press release is a tough job, and we might expand on that later, what do you think? First of all, be creative. The offline part of the story is important, however “online” your game is supposed to be. Think about events you can attend, (local) conventions for example. You can talk to players, ask for feedback and show them your passion for the project. We’ll sum up some of the things we did to promote our campaign. 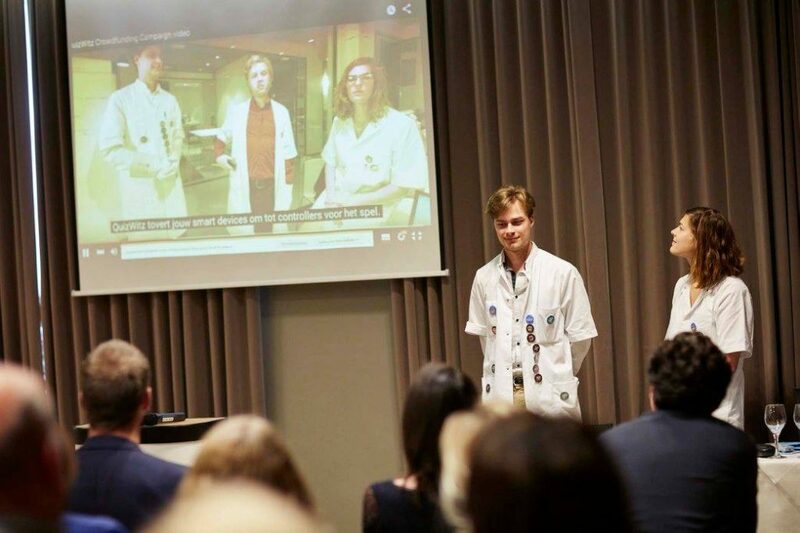 We grabbed every opportunity to go and pitch our game at different kinds of events. 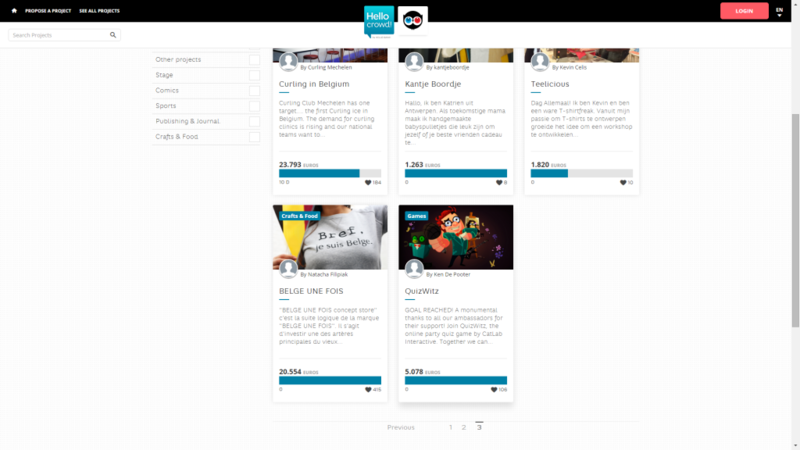 We especially looked for events concerning crowdfunding and indie game development. We went to see friends and family to show them how the game works, preferably with some of their friends there too. Though this worked quite well, we didn’t do it enough to have a big impact. There were two large conventions just before and during our campaign and so we had a booth there to let people play. Next to that, we attended some indie developer events to present the game and convince fellow developers to back. We even had an interview at the Indie Game Salon in Antwerp! We made promo materials to support our message. We handed out crowdfunding business cards on which we printed a link to the campaign and 6 questions to get players started! Last but not least, we started a new tradition that we’re continuing to do the coming months, year and hopefully longer! As a side effect of choosing for a local campaign, we were able to showcase our online game in the form of a more traditional quiz. We called this expansion on our game the QuizWitz Live events and even made the newspaper with it! 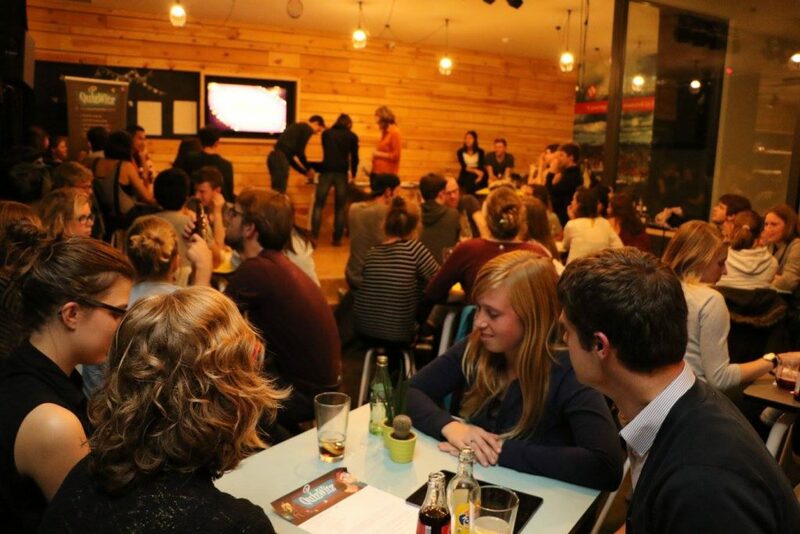 Find out when the next event will take place at the quizfactory (quizzes are in Dutch)! Start off with your intimi, then turn to your network and last, add some crowd into the mix. Don’t be afraid to promote your game in creative ways! Say thanks where it’s due. 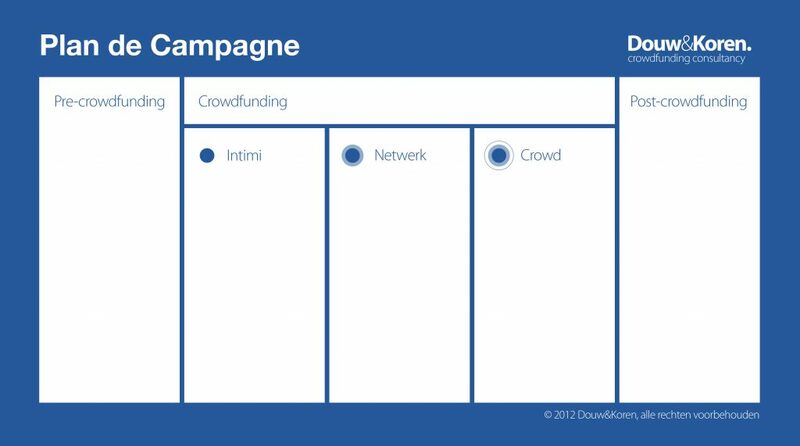 Keep in mind that crowdfunding is a game of change. What works today might be different tomorrow. It’s a game of people. Don’t do it alone, as you’ll want to build a community. Having a team that has your back will improve your chances considerably! We hope we could be of help with everything we’ve talked about. Thanks to our campaign, we’ll be able to release a new version of our game somewhere in the beginning of 2016! Stay in touch using the links below, leave your thoughts, or just join our community at QuizWitz.com! Posted bydaedeloth December 20, 2015 January 7, 2019 Posted inStartup LifeTags: QuizWitzLeave a comment on QuizWitz for Life!